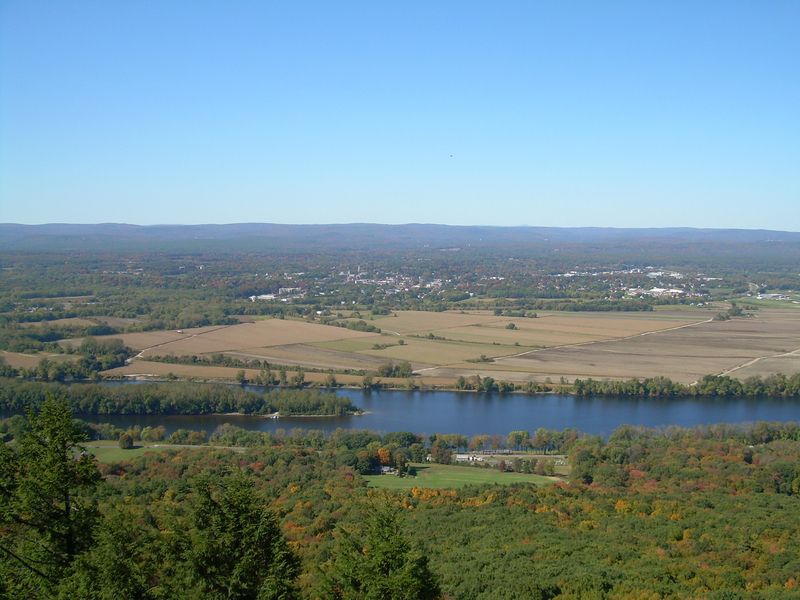 In August, 2006, when I moved to Massachusetts from Wisconsin to take a job at the state university in Amherst, I signed a year’s lease on half a duplex in Northampton, across the Connecticut River and about eight miles from my new office. Although I probably could have found a place closer to campus, I fell in love with Northampton when a future colleague drove me through it during my interview trip. 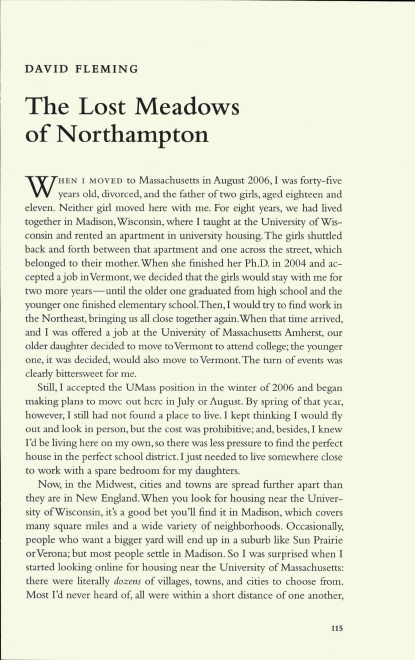 Compared with other places in the area, like Amherst or Hadley, Northampton seemed more lively, more urban: a better choice, I thought, for a middle-aged, single man who would be living alone for the first time since his children were born. Now, it’s hard to call a town of 30,000 people, in a region better known for its villages and farms, urban, but 350-year-old Northampton is laid out in a very dense settlement pattern, putting those 30,000 people, along with their homes and businesses, in very close proximity to one another. It also has a surprisingly vibrant downtown – with one of the best restaurant, bar, coffee shop, art gallery, and nightclub scenes in western New England. Standing at the intersection of Main, King, and Pleasant Streets on a bright fall afternoon or a warm spring night, you feel as if you’re in a much larger city. During my first few years here, I explored the town with energy and attention, walking downtown and back sometimes twice a day, finding it all inexhaustibly interesting. I loved the architecture, the historical sites, the small shops, the diverse population. Downtown was always busy, its shops and restaurants thriving, the wide sidewalks full of performers, protestors, smoking teenagers. And if I wanted green lawns, I could just walk to Smith College or the leafy neighborhoods that radiated out from the town center, with their close-packed houses, winding streets, and undulating terrain. In Northampton, I walked everywhere, all the time, alive to the little city’s big-city rhythms and idiosyncrasies. I lived here several years before I even heard of the Northampton Meadows. I was reading one day in Forbes Library, flipping through a book about Northampton, when I came across an essay by Patricia Wright titled “On the Ground: The Origins of Northampton’s Peculiar Plan.” In the essay, Wright recounts the story of the European settlement of the town, referring several times to the “great meadow” on the west bank of the Connecticut River: “well over 2,000 acres in extent, an abundance of rich, open land unsurpassed anywhere in New England” and just below the bluffs that became the site of the town itself. I recognized in Wright’s essay her description of Northampton’s town center, focused then as now on Meeting House Hill (today’s upper Main Street), and I could trace my own urban wanderings on maps like James Trumbull’s drawing of the city’s seventeenth century home lots. But anything on the outskirts of the dense little settlement was terra incognita to me. A “great meadow”? 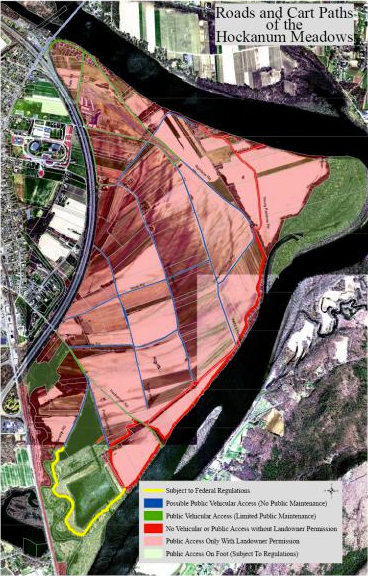 Two thousand acres of “rich open land” between the town center and the river? What was Wright talking about? I knew there was some farmland to the south and east of me, behind the houses on Pomeroy Terrace, down by the fairgrounds and the municipal airport, alongside the interstate highway. It was, I thought, and to be honest, the kind of urban wasteland one sees alongside interstate highways everywhere. 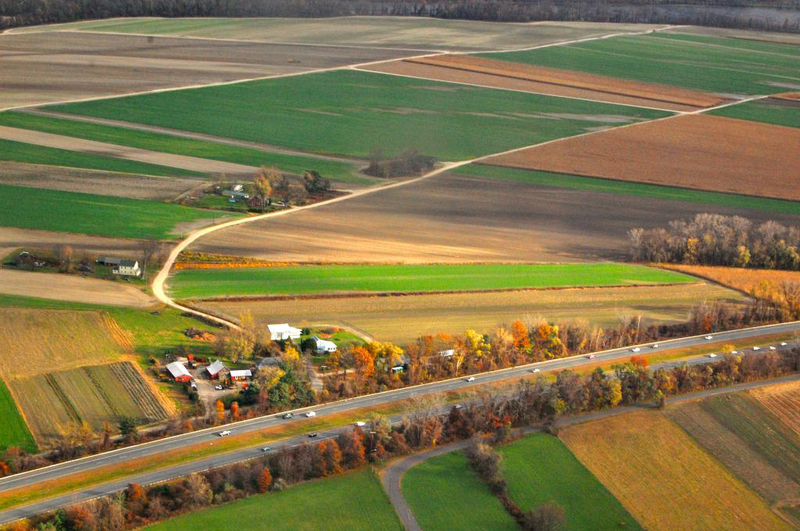 I didn’t think there was anything interesting about it – I certainly didn’t think there were 2,000 acres of rich, open, historically significant farmland there! Plan of the Town of Northampton by John G. Hales, Boston, 1831. Courtesy of Historic Northampton, Northampton, Massachusetts. The extent of my ignorance became clear when I saw the map on page 5 of Wright’s essay: it was John G. Hales’ 1831 “Plan of the Town of Northampton.” That map was a revelation to me. 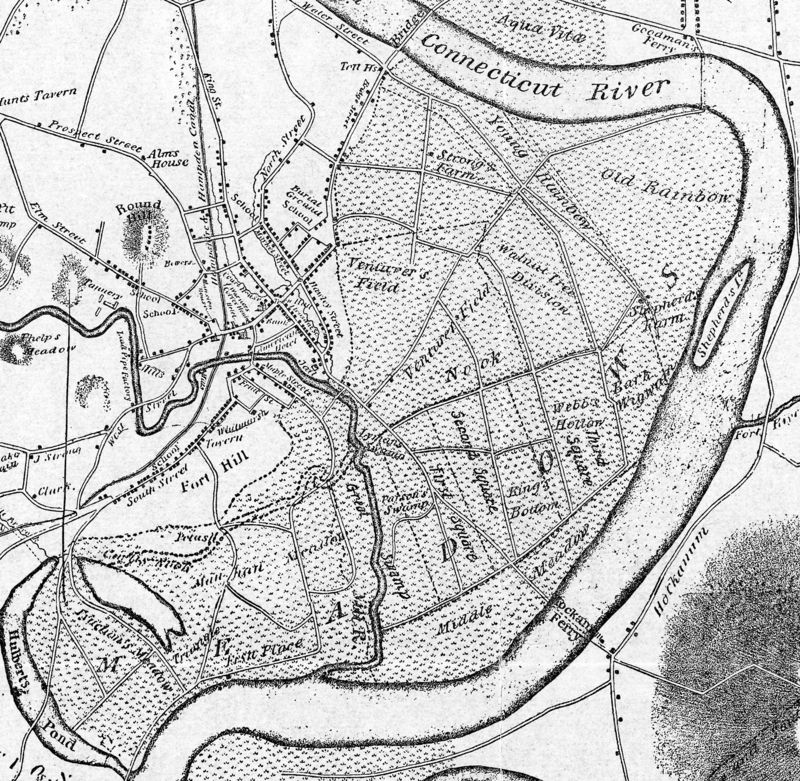 Nearly two centuries after the town was founded, a significant portion of Northampton was still open agricultural district – the huge floodplain by the Connecticut River, stippled in Hales’ map so that even on paper it looked unusually rich and fertile. 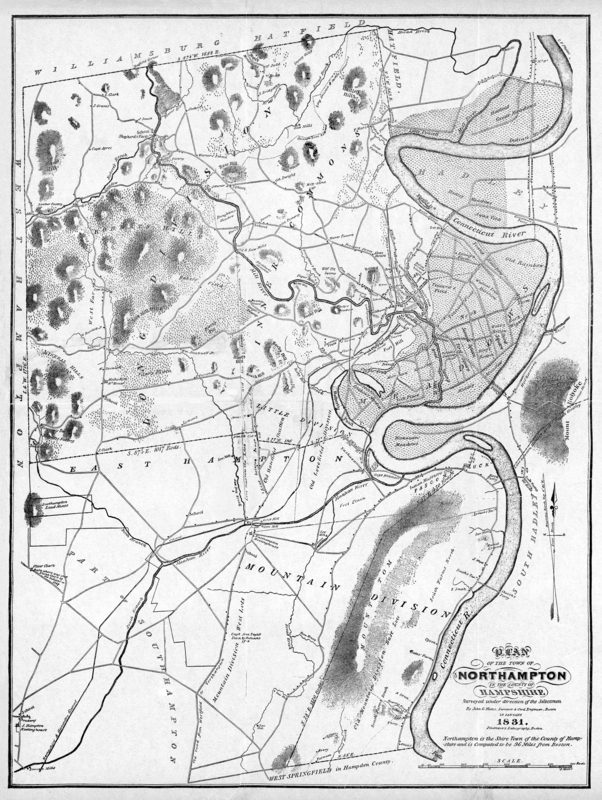 Wright’s caption for Hales’ map notes that “the ‘great Meddowe on the west side’ [of the Connecticut River] made Northampton the first English settlement north of Springfield.” As she explains in the piece, it was the meadows that the settlers were aiming at when they came here; it was the meadows that made this a place of interest to begin with. Plan of the Town of Northampton (Detail) by John G. Hales, Boston, 1831. Courtesy of Historic Northampton, Northampton, Massachusetts. 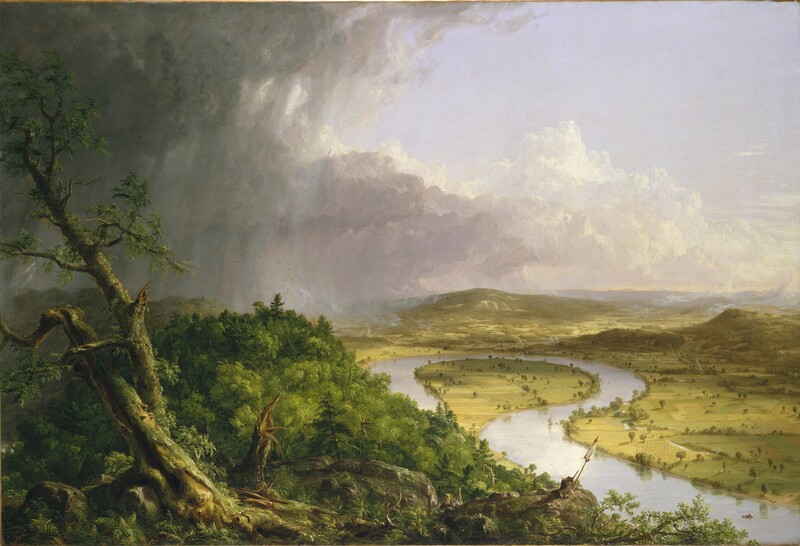 Thomas Cole, View from Mount Holyoke, Northampton, Massachusetts, after a Thunderstorm – The Oxbow, 1836. The Metropolitan Museum of Art, Gift of Mrs. Russell Sage, 1908. Looking again at Cole’s painting, something began to dawn on me. The meadows of Northampton were still here! And I had seen them! In the fall of 2006, soon after I moved here, I climbed Mt. Holyoke with my daughter Izzy and took a photograph from the place where Thomas Cole had made his painting of the Oxbow nearly two hundred years ago – though I was facing more northerly than he was. There, right across the Connecticut River, and between it and tiny Northampton, just visible in the center background, were the meadows of Northampton – as open, extensive, and fertile as they’d ever been (though not especially green in this October shot). I immediately began searching for the meadows in maps of the area. 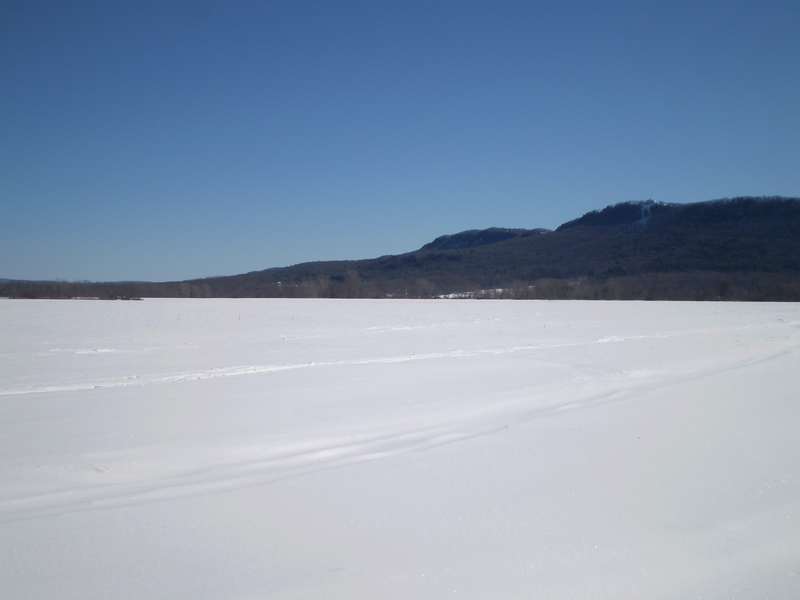 And when I found them, I realized that I passed them whenever I was on Interstate 91, driving south toward Springfield, and making that long graceful curve past the Oxbow of the Connecticut River and through the gap between Mounts Holyoke and Tom. Before reading Wright’s essay and seeing Hales’ map, I had always assumed on those drives that Northampton was all to my right between exit 19 and the two Mounts and that the farmland I saw to my left was something else – Hadley perhaps? 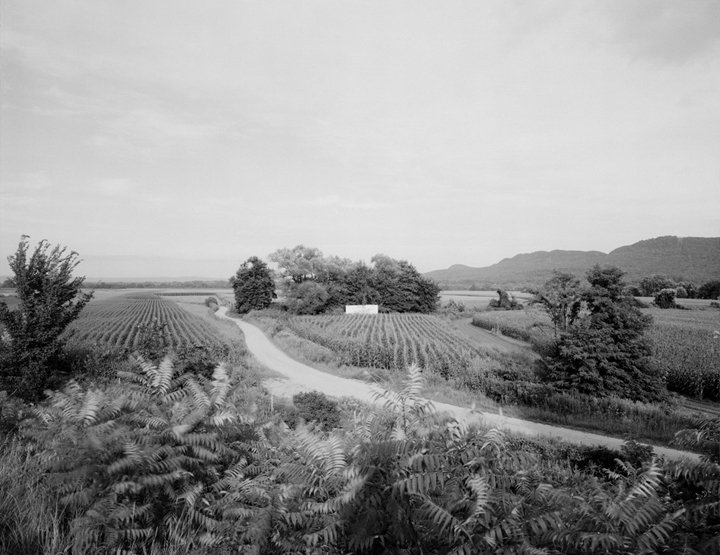 or a sparsely-populated rural tract under the Holyoke Range? I realized now that that farmland was, in fact, the meadows of Northampton, that they had survived fully intact into the present. Even more astounding, they were just a mile or so from my house! 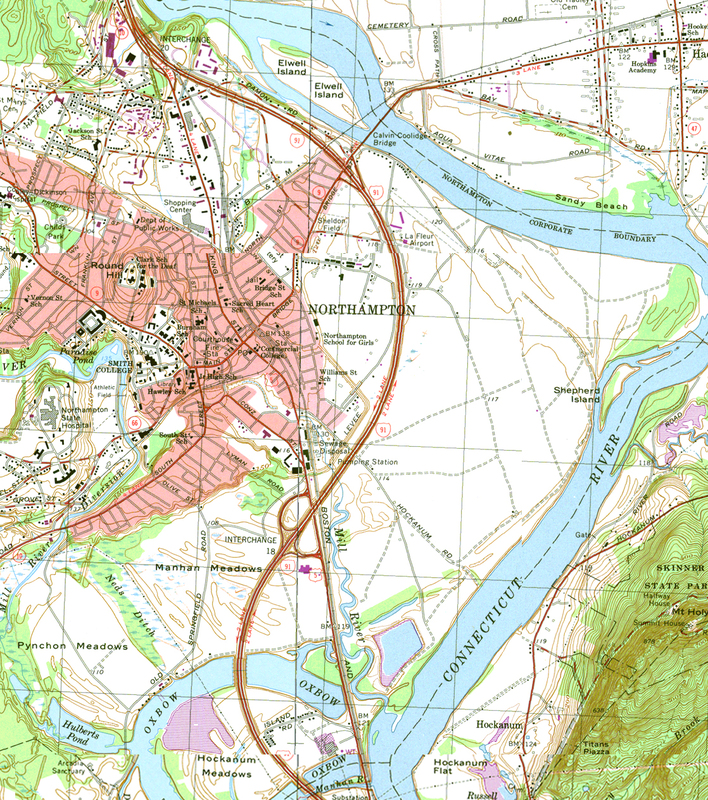 U.S. Geological Survey map of Northampton and vicinity (1964, photo-revised, 1979), compiled from the Easthampton and Mt. Holyoke quadrangles, 7.5 minute series (topographic) (detail). So, one day in November, 2009, I walked down Pomeroy Terrace and slipped through the arbor archway at the end of the street. I then followed the levee until it met I-91 and curved sharply to parallel it – I had done this before. But now, where the levee crossed Hockanum Street, I did something I had never done before, which I didn’t know I could or would ever want to do. I turned left, walked down the other side of the levee, and walked under the highway – as if through a hidden gate and into a secret garden. 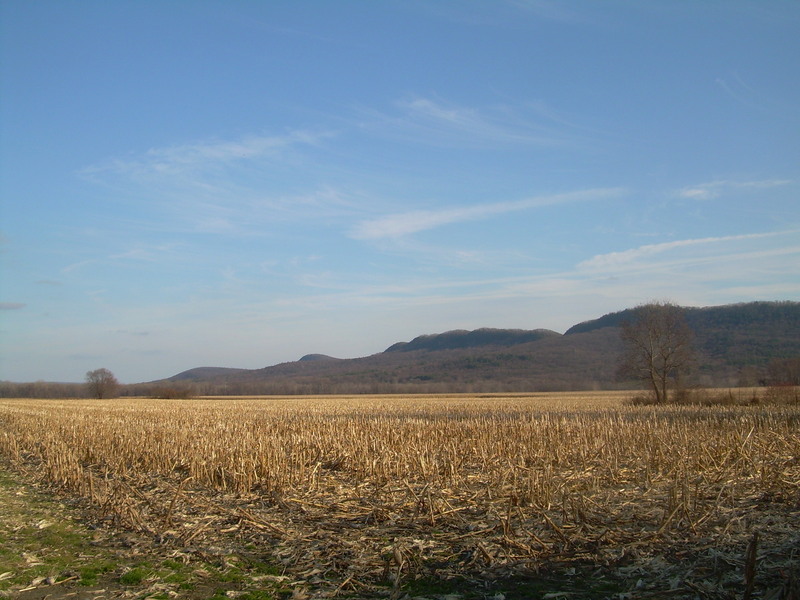 I was suddenly in a huge field, dry and brown in the cold autumn air, with a clear blue sky above me, the Holyoke Range in the distance, the dead corn stalks stretching as far as the eye could see. It was so quiet, so empty, so different from downtown Northampton – and yet so incredibly close. I followed Hockanum Road all the way to the river, the hum of I-91 gradually receding in the background. Later, I walked back into town. But by then I was hooked – and I found myself back in the meadows repeatedly over the coming years – in different weather, at different times of day, exploring different paths – always struck by how different this place was from the Northampton I had come to know. I know of few other places that combine, in such close proximity, such pristine agricultural landscape with such dense and lively urbanity. And yet, if the meadows of Northampton were once a fully integrated part of this town – every family with a house lot near Meeting House Hill also possessing wood and pasturage rights in the uplands as well as one or more meadow parcels for tillage and hay – at some point the “city” was dramatically segregated from the “country” here. By the middle of the twentieth century, the meadows were practically ghettoized in Northampton: closed off and hidden from view. Today, there are no historical markers anywhere in town concerning the meadows, there is nothing about them on Wikipedia, there is little public discourse about them anywhere. Many newcomers like me never even learn of their existence. Meanwhile, when you search newspapers and other sources for information about the meadows, the references returned are almost all about criminal activity. Irreparably separated from the town center since the late 1960s by the interstate highway, socioeconomically disparaged by, first, industrialization and, then, the knowledge economy, made inaccessible by the privatization efforts of landowners, the meadows have become something other, away, different. I told the full story of my learning about the Northampton Meadows, both the initial excitement and the subsequent dismay, in an essay published last year in The Massachusetts Review (vol. 54, no. 1, pp. 115-144). It’s an essay about my coming to a more integrated vision of the city-country dichotomy at the same time that that dichotomy was re-affirmed right in front of me. Since I published that essay, I’ve wanted to return to it, to update it, several times. Last summer, when reading Henry James’ Roderick Hudson for the first time, I realized how nicely one of the early scenes in that book, set in Northampton, would have fit in my essay – I later blogged about Henry James and Northampton here. Then, in November, I learned that I had missed a guided walk in the meadows, sponsored by the Kestrel Land Trust and led by conservationist Laurie Sanders. I would have learned a lot that day! More recently, I’ve learned that landowners in the meadows have adopted a new, much more aggressive strategy to block public access to the area, something I worried about in my 2013 essay. 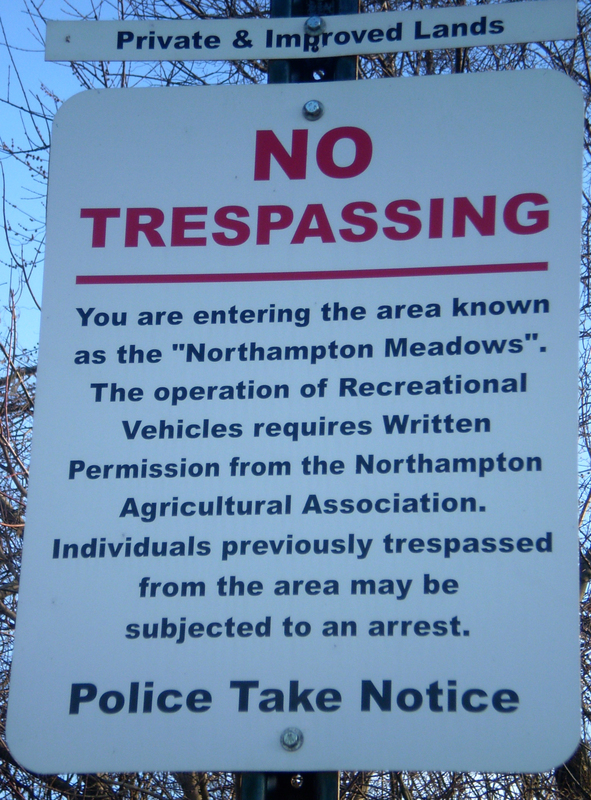 According to the Hampshire Gazette, members of the City of Northampton Agriculture Commission met on February 12, 2014, to try to mediate between meadows landowners and city residents – naturalists, birdwatchers, dog walkers, and others – who seek modest public access to roads in the meadows. You can see below, as I describe it in my essay, the rich interlacement of roads and paths that crisscross the meadows of Northampton, an area with a long history of full, open, responsible use by town families. Perhaps my own Google Map makes the attempted privatization of the region more visible, with the indisputably “public” roads drawn in blue. The implication of the landowners’ strategy here is obvious – and, in my opinion, outrageous: the entire rest of the meadows, long an important and integral part of Northampton itself, would become inaccessible to anyone but a handful of property owners. Most of those concerned about the landowners’ move seek only the responsible and respectful use of these historically public roads for walking. Walking. I hope the issue will be resolved in favor of public access. In the meantime, I plan to continue to walk in the meadows, on its historic public roads, respecting the land and its owners but also enjoying this place as Northampton residents have for three and a half centuries. I was there today, during this season of snowstorms. It was lovely: cold and quiet. For a PDF of my Massachusetts Review essay “The Lost Meadows of Northampton” (15 MB), click here. For Stephen Petegorsky’s photographs of the meadows, click here. For the Hampshire Gazette article on the February 12, 2014, meeting of Northampton’s Agriculture Commission, click here. For minutes of the Ward Three Neighborhood Association’s December 10, 2013, Board meeting, which included a discussion of the meadows, click here. 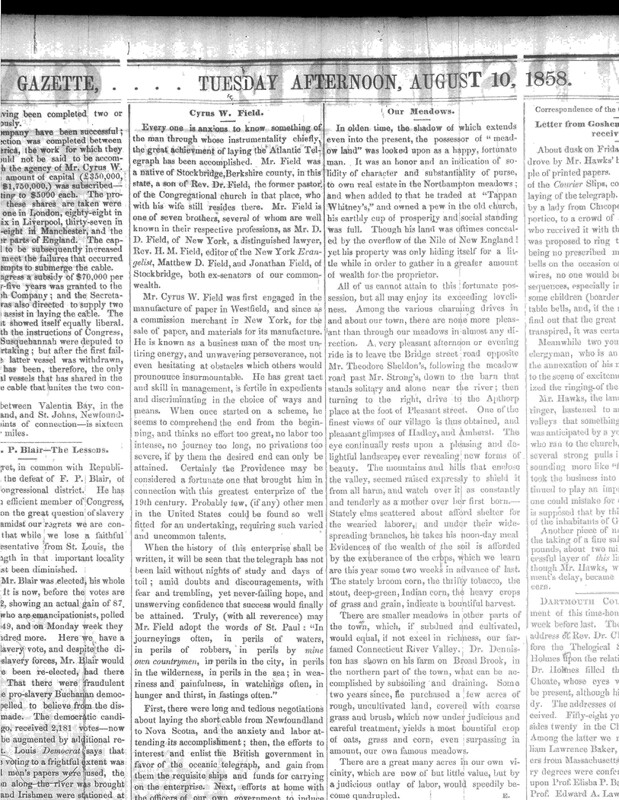 For “Our Meadows,” an anonymous article from the Hampshire Gazette, dated August 10, 1858 (thank you Rick Clark! ), click here. For Rick Clark and Stuart Clark’s “Demonstration of the Public Nature of Meadows Roads in Northampton, Massachusetts,” prepared for the Mayor of the City of Northampton, December, 2013, click here. 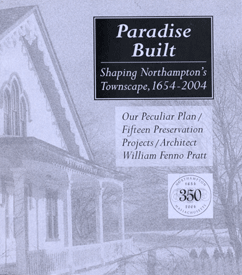 Patricia Wright’s essay, “On the Ground: The Origins of Northampton’s Peculiar Plan,” can be found in Paradise Built: Shaping Northampton’s Townscape, 1654-2004 (Northampton, MA: 350th Anniversary Committee, City of Northampton, Massachusetts, 2004). This entry was posted in inquiring, mapping, walking. Bookmark the permalink. I served for a couple years on the Northampton Meadows committee in the late 90’s. I lived near the ‘other’ meadows (which I hope you’ve also discoverd) off South St via Fort St that runs along the Oxbow out to Easthampton. I also had a friend who was killed in the Hockanum Meadows in the 90’s when she was walking there after dark and was struck and run over by a drunk driver joy riding through the corn. We tried to get the cops to step up patrols down there, especially on the weekends, and to put up speed limit signs. One cop was assigned to be the liaison to the committee. He basically stonewalled every suggestion we made and finally stated outright in a meeting that the NPD considered the Meadows ‘no man’s land’. Granted this was nearly 20 years ago now, but that cop is still on the force. I live in Easthampton now but still walk in and treasure the Meadows. It is crazy to propose the roads be made private and the bottom line is they will NEVER be able to enforce it anyway. But given the amount of lawlessness that does happen there, I understand the concerns and no its not the walkers and bird watchers. But there are a good number of addicts that take refuge there as well and its an incredibly large area to patrol. There are no easy answers for sure. You have no idea how relevant this post is to me. I am buying a piece of farmland in the Meadows. I consider the Meadows the best-kept landscape secret in New England. One I hope to help make a little better known, to the respectful sort of people! Also, have you noticed, from the maps in your post, that the Mill River was diverted? I know the new and the old channel, slightly. I never would have guessed!!! !